Eye On Sports Media: Willie Mays is NOT Dead! Willie Mays is NOT Dead! Apparently Google is on fire with people seeking information about Willie Mays dying. Willie Mays did not die. 50-year old TV pitchman Billie Mays was found dead in his Florida home. Mays was born in McKees Rocks, Pennsylvania. After graduating from Sto-Rox High School in 1977, he began his career as a salesman on the Atlantic City boardwalk, selling the Washmatik portable washing device to passersby. Working alongside other pitchmen, he developed his style of salesmanship. Mays later traveled to home shows, auto shows, and state fairs across the United States for a period of twelve years, selling various maintenance products and tools, including cleaning products and food choppers. At a Pittsburgh home show in 1993, Mays struck up a friendship with rival salesman Max Appel, founder of Orange Glo International, a Denver-based manufacturer of cleaning products. He was then hired by the company to promote their line of cleaners, OxiClean, Orange Clean, Orange Glo, and Kaboom on the Home Shopping Network in St. Petersburg, Florida. Customer response to Mays' sales pitches were enthusiastic, with a sharp increase in sales after his first day on the network, although some reviews were poor. He is very well known for shouting in an abrasive manner during infomercials. For example, Washington Post staff writer Frank Ahrens called him "a full-volume pitchman, amped up like a candidate for a tranquilizer-gun takedown." Following the success of the Home Shopping Network campaign, a line of successful television commercials and infomercials for the products was produced, featuring Mays demonstrating the effectiveness of the products to viewers hands-on. He typically begins such commercials with: "Hi! Billy Mays here for [advertised product]." Their success led to OrangeGlo International being named among the top ten privately growing companies from 1999 to 2001 by Inc. magazine, and its eventual buyout by Church and Dwight. Appel credited Mays' brilliant salesmanship for much of the company's success. Mays was the CEO and founder of Mays Promotions, Inc., based at his home in Odessa, Florida. His services as a pitchman became highly sought-after, and he appeared in commercials for many diverse "as seen on TV" products. Mays claimed to be an avid user of the products he promotes. In December 2008, Mays began appearing in ads for ESPN's online service, ESPN360. These ads were a slight departure for Mays as they were designed to be parodies of his and other infomercial cliches with Mays appearing to be doing a parody of himself. He also made a live appearance during the 2008 Champs Sports Bowl promoting ESPN's and ABC's January 1, 2009 bowl games. Mays resided in Florida in a $1.8 million home which was built in 2005. In February 2009, Mays publicly challenged Offer "Vince" Shlomi, also known as "Vince Offer" to a "pitch-off" between their respective products, the Zorbeez and the Shamwow. Popular Mechanics compared the absorbancy of two towel products and declared Shamwow the clear winner. On April 15, 2009, the Discovery Channel began airing Pitchmen, a documentary series that features Mays and Anthony Sullivan in their jobs in direct response marketing. 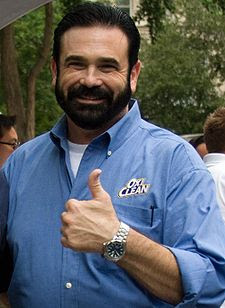 On the June 10, 2009 episode it was revealed that Mays' trademark blue shirt was the idea of fellow pitchman Sullivan before the OxiClean commercial shoot in 1999. Mays and Sullivan appeared together on the June 23, 2009 episode of The Tonight Show with Conan O'Brien. More recently, the commercials for his products have become a popular internet meme, and have spawned countless video remixes. Mays was found unresponsive by his wife in his Tampa, Florida home on the morning of June 28, 2009. He was then pronounced dead at 7:45am, having died sometime in his sleep. The Associated Press reported that there were no indications that the house had been broken into, and that police did not suspect foul play. Mays had been aboard a US Airways flight that blew out its front tires as it landed at Tampa International Airport on June 27, the day before his death. None of the 138 passengers and five crew members were reported to be seriously injured immediately following the incident, but several passengers reported having bumps and bruises from falling objects. Mays told a local Tampa TV station that some of the objects "hit me on the head, but I got a hard head." It is unclear whether Mays' death was related to the incident.